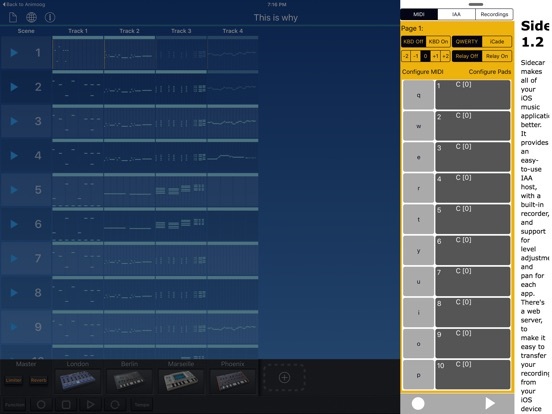 Sidecar is designed to work with the slide-over and split-view features of iOS 9 on the iPad — pair it with DAWs, synthesizers, sequencers, audio loopers, or guitar amp simulators, to add quick and easy control of settings, trigger notes and chords, and more. Sidecar supports external Bluetooth keyboards and game controllers. Add IAA synthesizer apps to Sidecar, and use the built-in mixer to adjust volume levels and panning. Record directly into the app, or stream the audio over WiFi. There’s even a built-in web server, to give you easy access to the recordings from the desktop. With ten separately configurable MIDI destinations you can quickly set up a set of assignments for each of the MIDI apps that you use. Have a set of chords for Animoog, choose different presets for ToneStack, or assign pads to different samples for DM1. Each MIDI destination has ten configurable pads, which can be assigned to chords, single notes, a program change message, or a controller change message. For notes and chords, the touch position controls note velocity. For controller change messages, the location of a touch on screen can be used to determine the controller value. Toggle on support for the external keyboard, and you can switch between the ten MIDI destinations quickly (using the keys in the QWERTY row). Toggle on or off any of the ten pads by pressing the number keys. The two lowest rows of keys are mapped as a standard piano keyboard, providing a musical play surface with an ordinary text keyboard. Note that QWERTY keyboards only send “key press” information to your iPad — to silence a sounding note, you simply tap the space bar. Sidecar also supports the iON iCade game controller, mapping the buttons of the iCade to the pads. Because the iCade was designed for games, it sends button press and release information, which makes it easy to toggle on and off the pads. If you have an external MIDI controller, you can have it send MIDI events to Sidecar — and these will be relayed to any of the ten MIDI destinations you select. Use this to quickly switch from one synth to another. 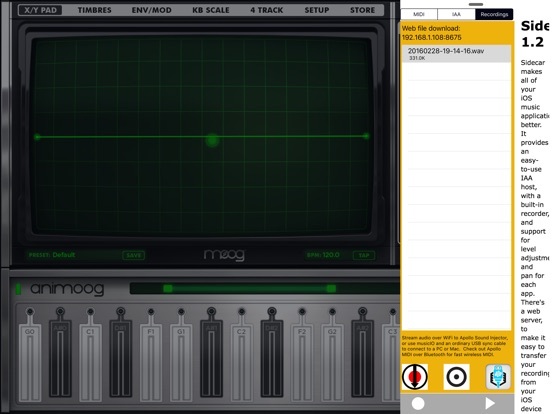 Because Sidecar sends MIDI messages, it can be used to control background synthesizers, sequencers, and effects apps. 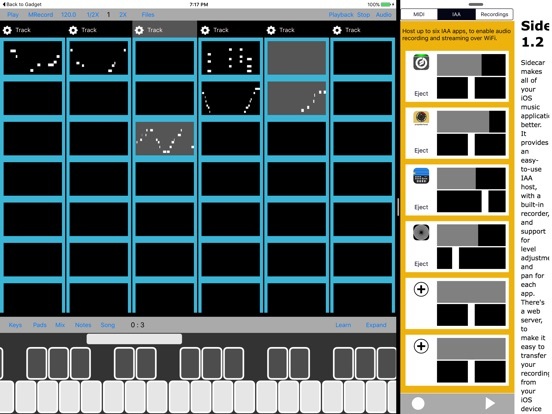 Sidecar is a great companion to the pitch-to-MIDI app MIDImorphosis — you can set up the mapping to control processing of notes, and to toggle between polyphonic and monotonic mode, or to toggle on and off support for pitch bend. MIDImorphosis has opened up a world of synthesis to guitarists, and Sidecar makes it even better. Because Sidecar uses MIDI, you can have MIDImorphosis in the background, and still control it. And with support for QWERTY keyboards, you have an inexpensive remote pedal controller. The app is a great addition to guitar effects apps too. 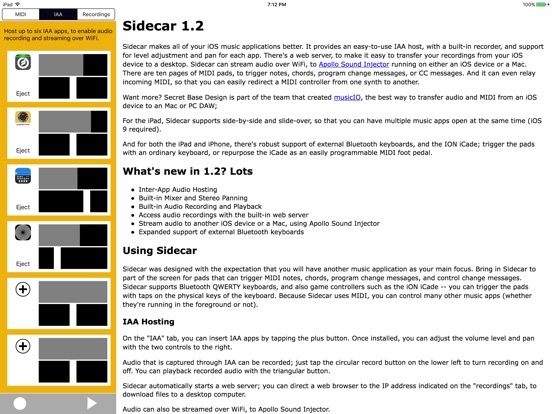 Sidecar is designed to work along side your other iOS music apps, and takes advantage of the latest features of iOS 9. For slide-over, you must have an iPad Air or an iPad Mini 2 or better. For split-view, you’ll need and iPad Air2 or an iPad Pro.